(Updated on 03.03.19). Haryana Staff Selection Commission (HSSC) released final result of Police Constable and Sub Inspector Exam 2018. Earlier, the commission extended last date for online application for recruitment of 6647 posts of Police Constable (Male & Female) under Haryana Police Department against Advt. No. 03/2018. 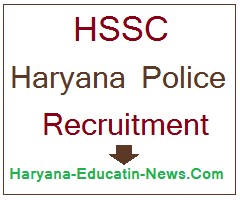 HSSC has re-advertised these posts and invited online application from eligible candidates for HSSC Police Constable Recruitment 2018 against Advt. No. 03/2018 through official website of HSSC i.e. www.hssc.gov.in. The last date for online application for these posts is extended up to 25.10.2018). The above (5532) posts against advt. no. 5/2017 & 1/2017 were earlier withdrawn by Department. Here is the full details about categories-wise posts, application fees, exam schedule/syllabus, eligibility criteria, qualifications, age-limit & admit cards. Advt. No. 5/2017 was canceled by the Commission vide Letter No. 4064/E-II (1) & 4068/E-II(1) Dated 30.03.2018. The Commission has re-advertised 6647 posts of Police Constable (GD) against advt. no. 3/2018. Here is the detail. The final result has been declared on 03.03.2019. The written test result of Police Constable (Male), cat. 01, 02 & 03 was declared on 02.02.2019 & 07.02.2019 respectively. The Physical Screening Test (PST) was held as per the schedule. Note 1 : These posts were advertised earlier by HSSC against advt. no. 1/2017 & 5/2017. But the Commission canceled the advt. no. 1/2017 & 5/2017 and withdrawn 5532 posts of Police Constable. The candidates who had earlier applied against these posts will also be eligible against re-advertised posts and such candidates will be exempted from the payment of application fee. However, such candidates who have already applied against above advertisement earlier need not apply again as their old application will be considered. Minimum educational qualification for the post of Constable shall be 10+2 for all categories. Knowledge of Hindi/Sanskrit up to Matric Standard. Post Name & Cat. No. iii) Scanned Copy of BCA/BCB/SC/PHC/SBC/EBPG Certificate issued by competent authority. iv) Scanned Copy of Haryana Domicile Certificate in case of BCA/BCB/SC/PHC/SBC/EBPG/ESM/DESM/DFF and women issued by competent authority. vi) Copy of Challan/credit certificate issued by Treasury/e-Challan as the case may be, in case of candidates who have applied earlier. ii) Printed Copy of online application form along with latest stamp size photograph duly attested by a gazetted officer and pasted on the application form. Selection for the above said posts will be made through physical screening test (PST), Written Test/Knowledge Test (KT) and personality test/interview. Candidates can apply online for the above said posts of HSSC Advt. No. 03/2018 through official website of HSSC i.e. www.hsssc.gov.in from 28.04.2018 to 28.05.2018 (extended up to 25.10.2018) till 11.59 P.M. Note : For detailed information of the above said posts of advt. no. 03/2018 visit the official website of HSSC or download the HSSC Advt. No. 03/2018 at the below link.